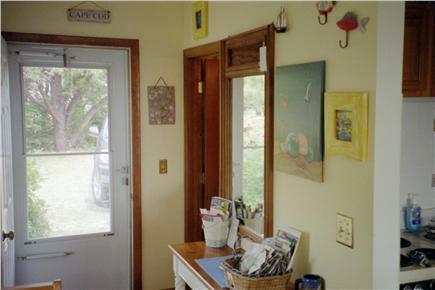 2 quick miles to beautiful peaceful Head of The Meadow Beach! 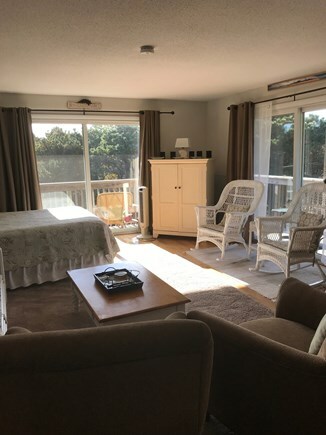 This sun drenched, non smoking, 500 sq ft studio end unit with 2 sets of sliders that lead to a large wrap-around deck with dining table set, chaise lounges and additional chairs to relax on is available for weekly rentals through the fall of 2018. This is only 1 of 4 end units and only 1 of 2 with a wrap-around deck! 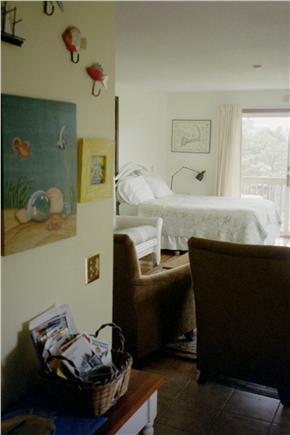 End units provide additional privacy for your vacationing pleasure as well as additional natural light and cool breezes. Relax on the deck with one of the new comfortable chairs or enjoy sitting at the outside deck table with a cup of coffee or a meal. For those extra warm days & nights we now have central air conditioning. A recent bathroom remodel, all new interior paint, draperies and flatscreen TV make this condo a true home away from home. For those extra cool nights electric baseboard heat is available. A Queen sized bed and new full size futon/sofa are provided for your sleeping comfort! 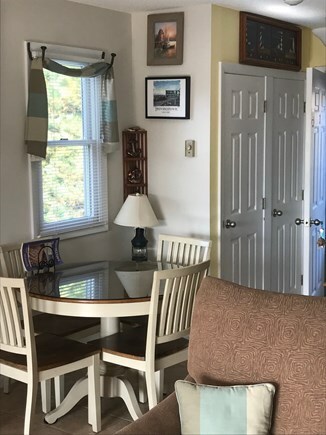 Brand new oak hardwood flooring for the living area and new tile in the kitchen, bath and entryway give you all the comforts of home while you vacation at the beach. Onsite manager and experienced cleaner to take care of any issue that could arise during your stay. 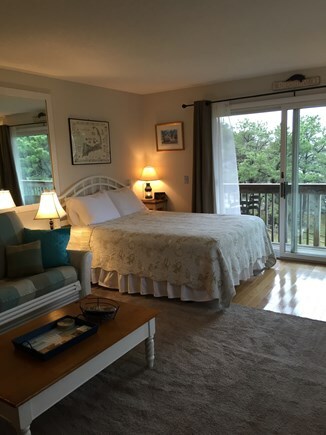 All of our past guests have commented on how clean this unit is upon their arrival. 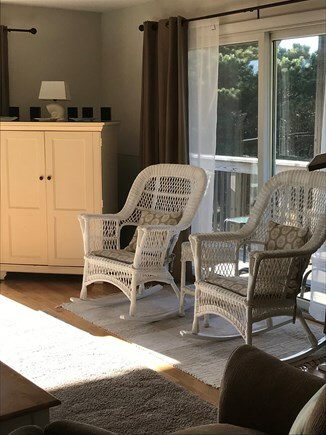 Make yourself at home and relax or stretch out on the full size futon/sofa, sink into the 2 new easy chairs or sit and read or rest in the wonderful wicker rocking chairs. The 2 large sliders and additional window over the kitchen eating nook give you the pleasure of natural light to read or work at various locations in this condo. 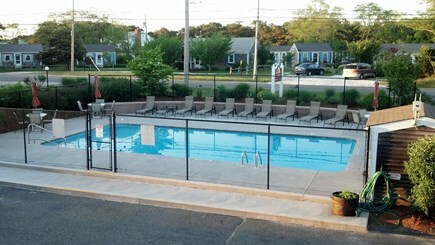 Also includes in-ground pool with deck area, full kitchen with all appliances, color cable TV, VCR, DVD, CD/sound system, phone for local calls or PC connection, all linens with daily fresh towel exchange, outdoor grills and picnic tables. Town shuttle to Provincetown, just 7 miles away, stops in front of our door. Why not sleep in quiet Truro and play in exciting P-Town. 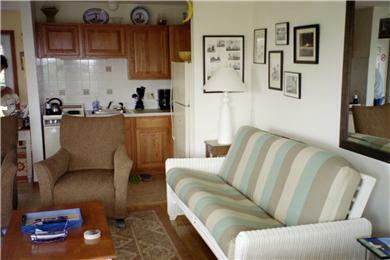 This extremely popular condo has been fully rented by the week from Mid May to Mid October since 2004. 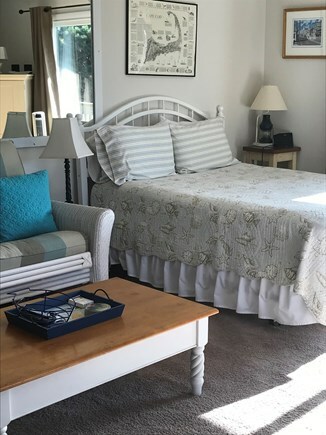 The comments in our guest book attest to the fact that this unit is pristine clean, extremely well kept and filled with every amenity to make your Cape Cod stay a memorable one. Thank you so much for offering your lovely home to us! We enjoyed very restful nights sleeps. We've been coming to Truro for the last 30+ years. You created such a comfortable space we literally feel like we are coming home. We usually come here in July or August however this year we came earlier and we loved how easy it was to get into our favorite restaurants without a wait or reservation. So sad to leave your wonderful little haven. We thoroughly enjoyed ourselves, so much so we'd like to inquire about reserving the week before the 4th next year. Your really know how to make your condo a visitor's home away from home. We had another wonderful time here at this paradise. First week was great fishing, second week not so much. Love it here! We sure had another outstanding time at the condo! What an amazing summer, hot weather, warm beach water temps. The whales were going back and forth along Herring Cove Beach, never have seen so many in our 30 years + coming here. Hope to return next year! Keep us in mind. PS. On our last night the coyotes were howling. We suppose they were saying good bye. The A/C unit was great seeing how hot, sticky & humid the time we spent in Truro was. Thank you so much for this little "home away from home". We ended up arriving in rainy weather but it soon cleared up and was mostly sunny all week. We really enjoyed Corn Hill Beach the most. We also enjoyed the deck and being able to relax. This was my first vacation in 5 years. It was wonderful and cozy. After visiting PTown tonight it was nice to walk into a warm, cozy unit. Thank you so much and we hope to visit again.